Nestled deep in the Chiltern Hills sits Stonor Park, an 18th Century palatial home to William Stoner and family. 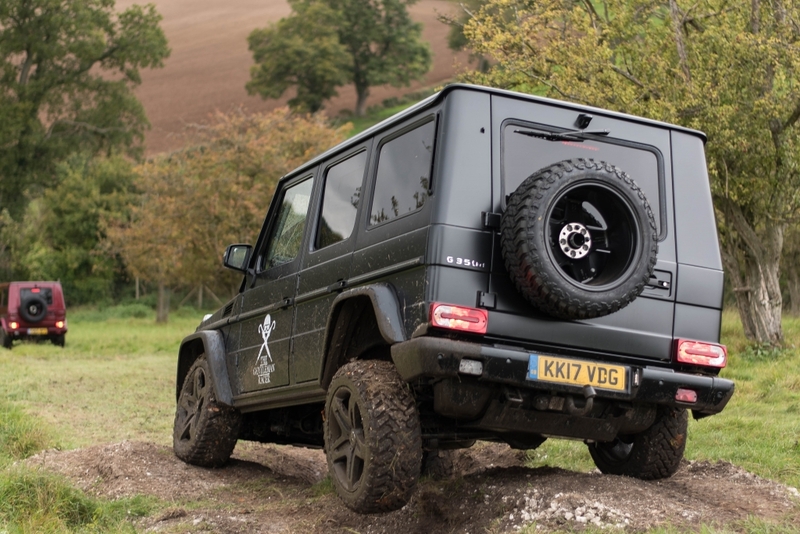 Tucked beautifully behind iron gates and stonewalls, it is also my destination for the day, as Mercedes-Benz has offered the chance to put its long-serving range of G-Class vehicles to the test. Descending the long and pleasantly speed hump-free driveway gives me a chance to fully appreciate the surroundings and marvel at the incredible estate that the Stonor family has opened up for this privileged group. Today, over £1 million worth of G-Class (G-Wagon to most) awaits our arrival, lined up elegantly against the red brick walls. 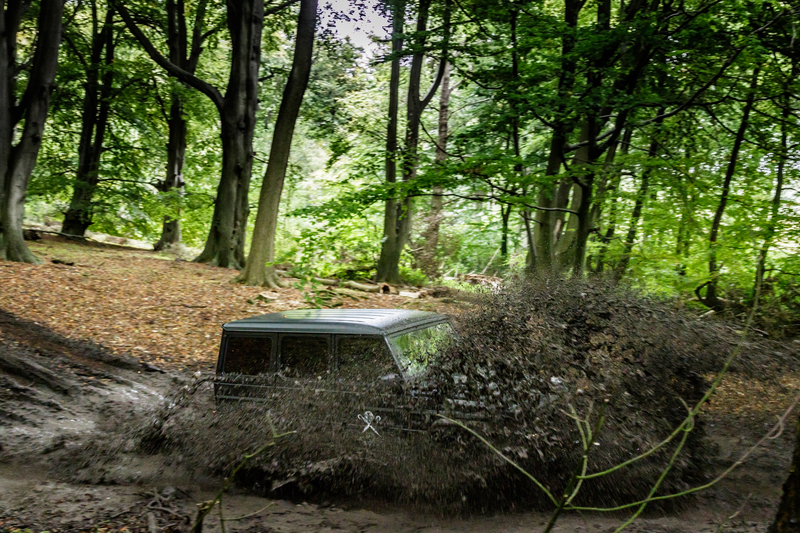 But I’m not here to admire, I’m here to drive it on terrain that it as always designed to tackle. With the majority of these capable off-roaders heading to smooth tarmac streets, the closest most get to venturing off the beaten path is the cobbled mews of a back alley in central London. For the lucky few cars in front of me, however, they’re about to do what they do best – hit the slopes. Visually, little has changed since it was launched back in 1979, and it remains the longest running model series in Mercedes-Benz history. With its robust ladder-frame construction, permanent 4MATIC all-wheel drive and a raft of electronic driver aids specifically calibrated for the arduous off-road work, the G350d that I’m about to drive can tackle pretty much anything in its path. 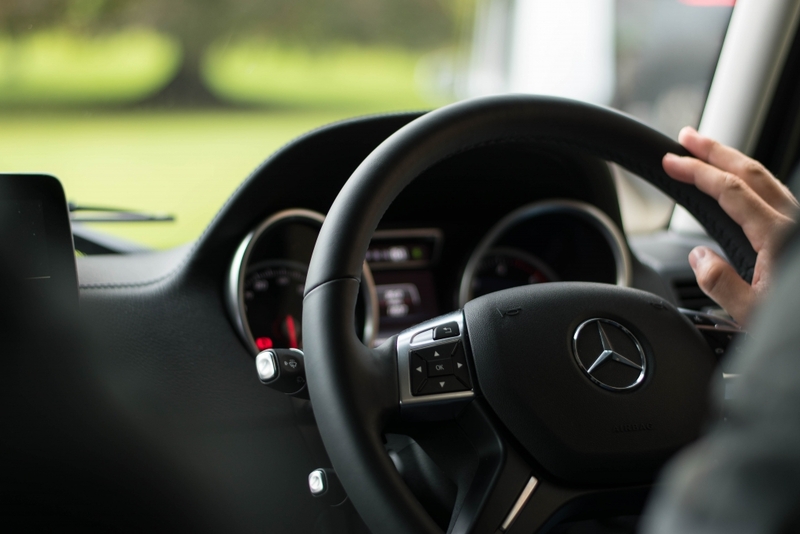 Pastries and leaded coffee out of the way, I select the meanest looking Geländewagen I can find – matte black with tinted windows, enormous black alloys and black window trim lend it an extra menacing air. Certainly befitting of the G-Wagon’s reputation for an intimidating road presence, it is kitted out with a 3.0-litre V6 Turbo-charged diesel and commands a hefty £103,000 price tag. Paired with pro off-road instructor Simon Phipps, I have a briefing about the vehicle’s abilities and promptly set off, engaging Low Range mode to the locking central differential. Now, I’m told this is one of the most capable off-roaders out there, and as we make haste back along the grand driveway, I find it hard to see how a car so capable and refined on the road will fare when heading into the woods. Still, following the hero car as a guide (one that has had Valtteri Bottas at the wheel during a UK coast-to-coast event Mercedes hosted last year) it becomes immediately clear that this giant easily handles the undulating Chiltern countryside. It’s smooth, quiet and comfortable from inside the luxurious cabin. 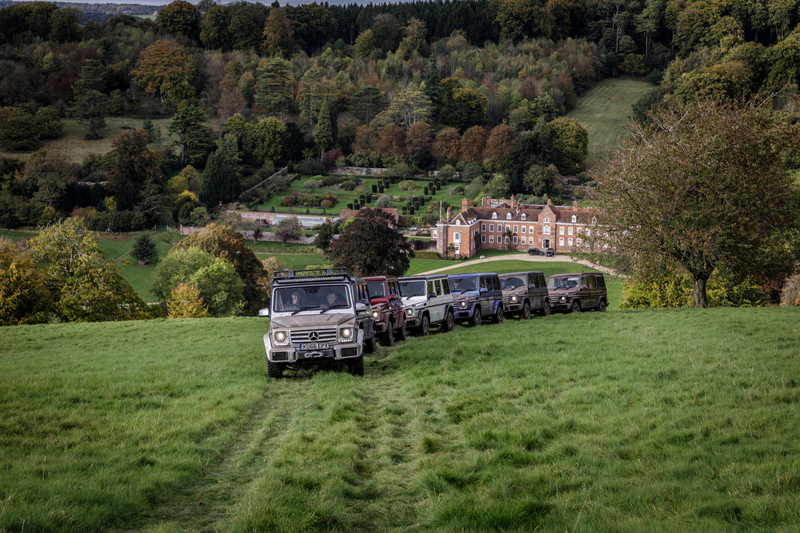 Starting out with a relatively tame hill climb over grass, I’m immediately met with a herd of fallow deer careering past our small convoy of G-Class. But there’s not much time to stop and admire nature, so we push on and arrive at the next crest of a knoll, which gives me an immediate vantage point in which to take in the surroundings, overlooking Stonor Park in all its splendour. Following the silver G-Class lead car onto the next stage, I get used to the elevated driving position and the home comforts provided by the menacing machine, and begin to understand why this is a favourite among the London set. But the comfortable cruise is rapidly interrupted by what the Stonor family describes as ‘bomb holes’, an example of which has just swallowed the G-Class ahead of me. With words of wisdom from my experienced passenger and using the steering wheel-mounted paddles to give me control of the engine braking, I ease into the giant chasm with surgical precision, descending into what feels like a vertical drop. Astonishingly, we escape unscathed and I’m encouraged to nail the throttle in order to ascend out of the void. Grinning from ear to ear, (more out of amazement and relief than anything else) I turn to Simon, who gives me a nod of approval. Or perhaps it’s a nod of pride, seeing as the car’s prowess managed to avoid an embarrassing stuck-in-the-mud moment. When Mercedes-Benz told me we would be foraging for our own lunch, I was sceptical to say the least. Not one for camping – or indeed having to capture my food before cooking it – we stop in convoy under an expanse of ash and oak trees, where mushroom foraging expert Matthew Dorrich is awaiting our imminent arrival next to his own navy blue GL350. Master of the Mushroom, as I had decided to call him, was grasping a wicker basket laden with exotic produce apparently sourced moments before our less-than-subtle arrival. 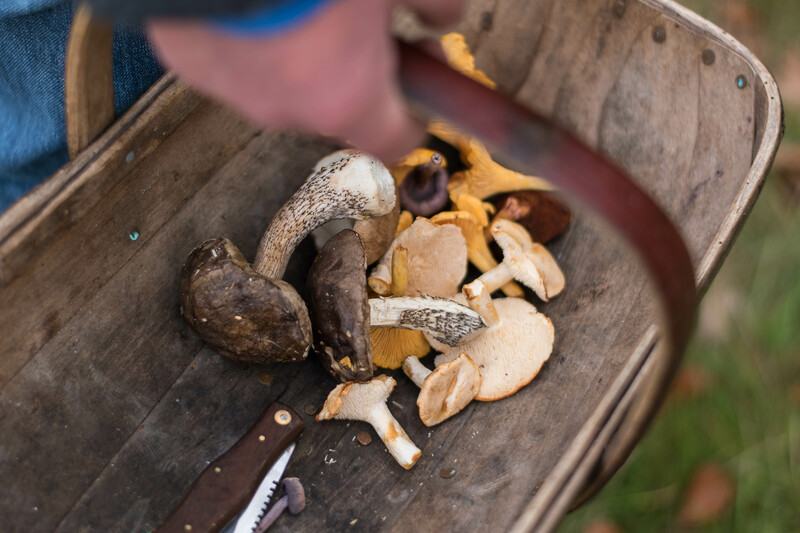 Cars parked up, we head off into the woods with Matthew and the rest of the group, as he describes the difference between a good and bad mushroom – picking out various growing examples that would have been invisible to the untrained eye. Genuinely fascinating mushroom lesson over, it’s back to the formerly-matt-black-now-half-brown G-Class and onto the next round of mud-plugging, with the big Mercedes leaving Matthew behind with his collection of fungi that would form part of our lunch. My off-road mentor encourages me to cycle through the many differential settings to understand their uses. It proves a masterclass in off-road knowledge from a man who had recently completed the Trans-America coast-to-coast trail earlier in the year. Without him, I would have almost certainly got stuck. The G-Class is a more than capable beast, but with all these things, if it is driven incorrectly, it can go horribly wrong. 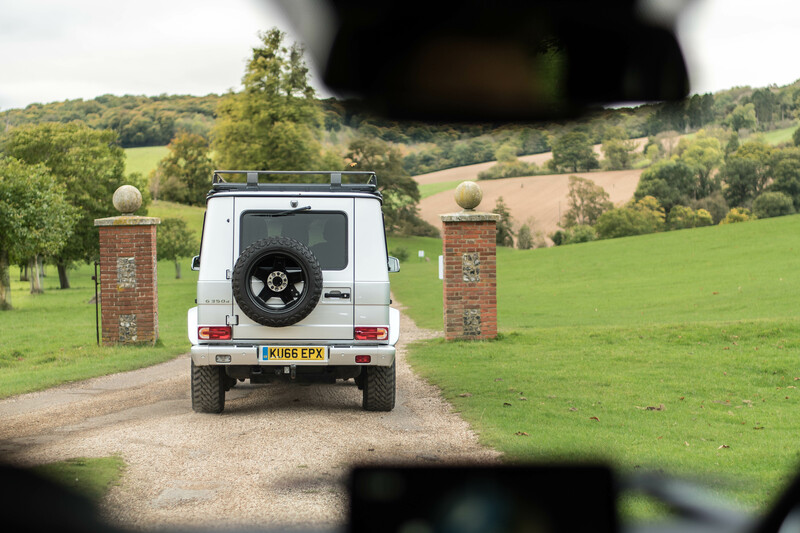 Taking in more of the incredible Stonor Park Estate as we progress deeper into the route, the G-Class really begins to shine. Nothing is too much effort, and when it does encounter an obstacle, there is a setting to bat it aside like a pesky fly. This G350d model can ford water up to 600mm deep, climb 80 per cent gradients and tilt at an angle of 54 per cent without toppling over. With lunch on the horizon, we battle through the final forest stages and into a secluded spot deep within the trees. It’s a welcome break from the brain-sapping concentration of manoeuvring the G-Class through some very narrow passages. 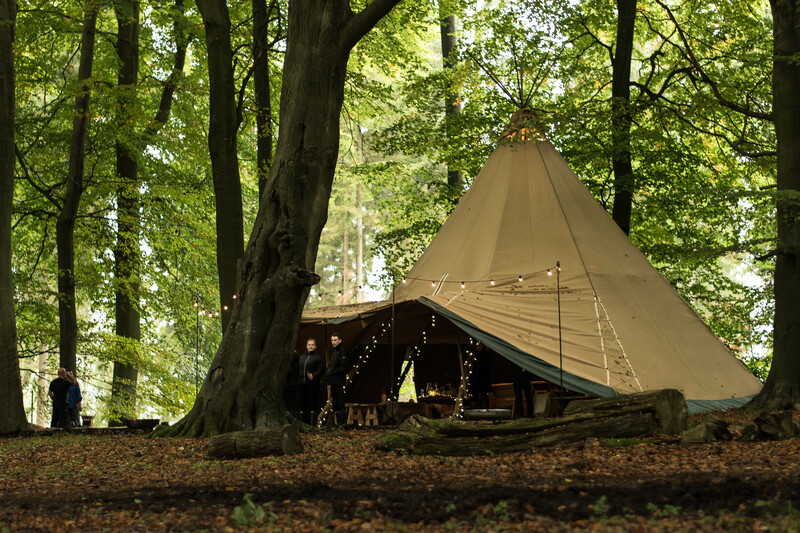 We arrive to the site of an enormous teepee that Mercedes had set-up for this event, complete with an open fire pit for the true outdoors experience. Our small group enjoys a nettle and pigeon starter, mushroom canapés and muntjac deer main, but I am itching to get back out in the G-Class and take on more of the Stonor’s private playground. I feel like I’m getting hooked. The last of the mint tea disappears and I’m back in the saddle for our final descent back towards the manor house. 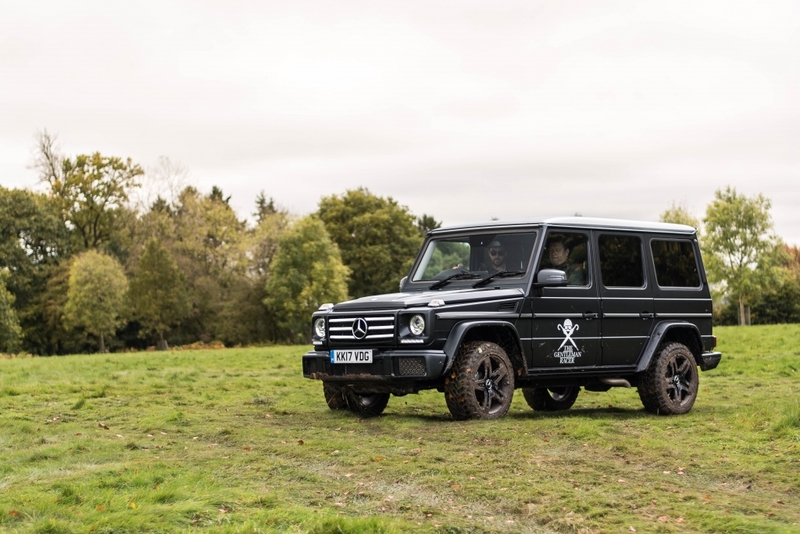 A challenging drive back towards the grand driveway makes its clear why the G-Class has won the Paris-Dakar rally outright, transported two Popes in its model history and has rapidly become a must-have for the London crowd. 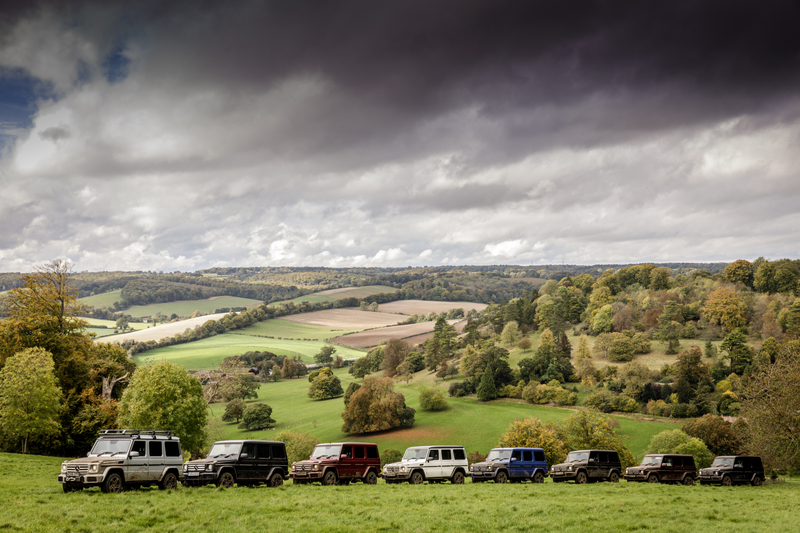 Despite the fact it is getting a little long in the tooth, there’s no denying its unrivalled combination of all-road ability and exceptional interior luxury make it one of the best off-roaders in the game. Retiring to the manor house brings mixed emotions. The grandeur of the estate is a sight to behold but I know that the moment I return to the well-kept lawns of the hall, I’ll be handing back the keys to a car that has completely won me over. 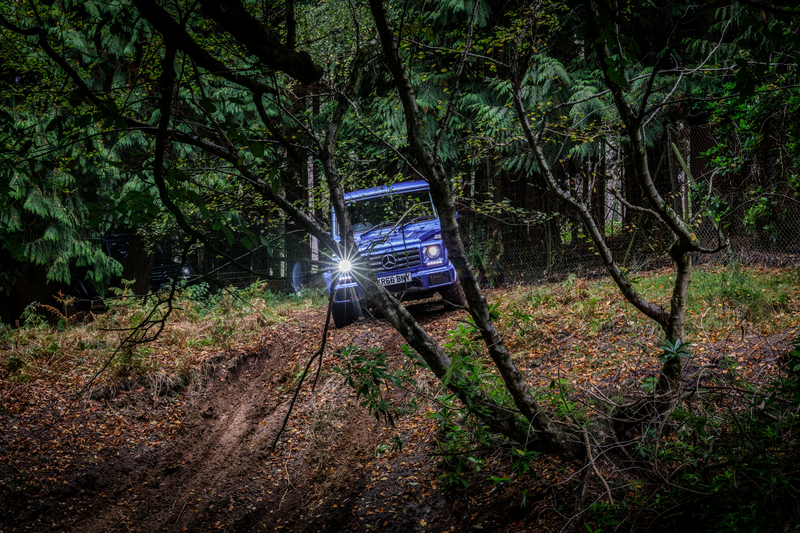 Granted, I’d still take the smooth tarmac of a racetrack in a classic car over the Great Outdoors any day, but if I absolutely have to tackle the rough stuff, the Mercedes-Benz G-Class would be at the very top of my list.